← Central Laos: A tube, a cave and a Capital City. While in Vientiane, I met up with Stefan and Tom who were planning to head out on an adventure in search of the Kong Lor Cave. They had heard that it is one of the highlights of Southeast Asia and the plan sounded like a lot of fun, so I decided to tag along with them. We left Vientiane after Tom got his new Thai Visa (the reason he came back to Laos) at around 3pm and rode a local bus to Vieng Kham. This small town had one guesth0use and a couple of restaraunts. 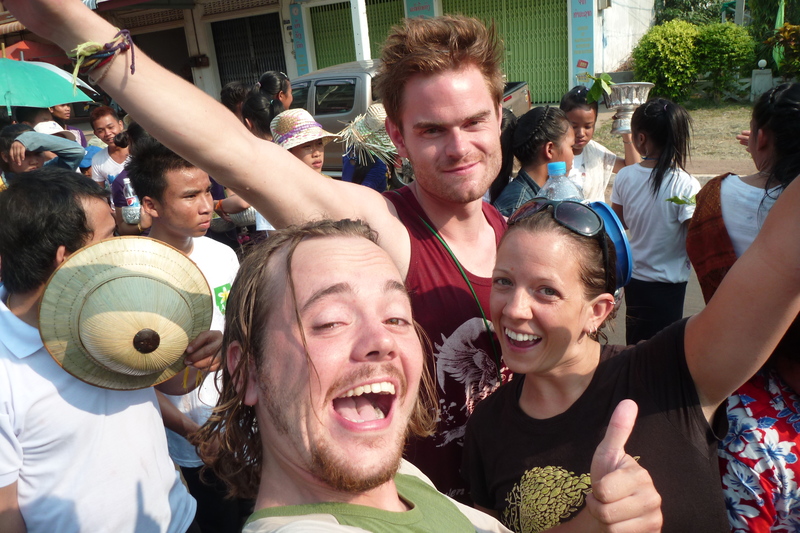 The next morning we got a large tuk tuk to the next town an hour away before renting motorbikes to ride to the cave. I chickened out of getting my own bike, so I got on the back and enjoyed the hour ride. We passed through flat fields surrounded by huge limestone cliffs and drove through some very small villages where small kids came running out to the road to wave at us and yell hello as we went by. 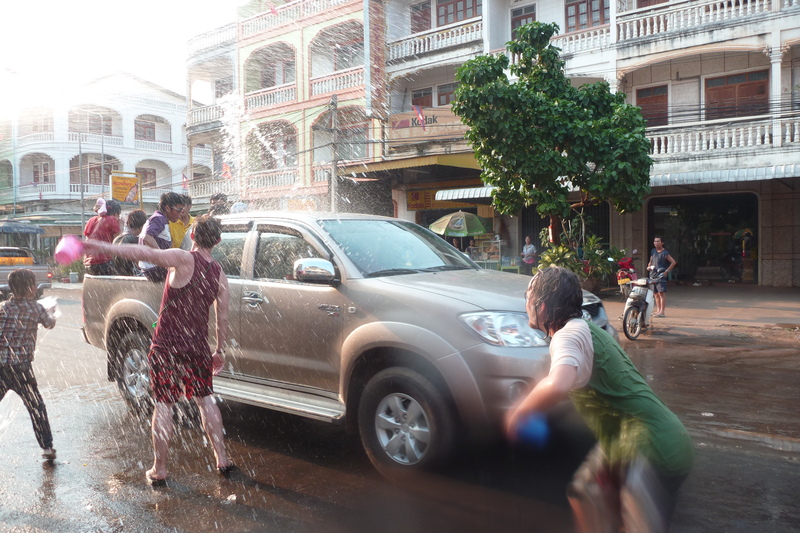 As it was the start of the Lao New Year (Songkran) which is also a multi-day national water fight, some also came running out with water guns or small buckets to try to get us wet. We arrived at the cave, parked and went to explore. The beginning of the cave is found at the end of a small lake, and just inside the entrance were a number of boats waiting to take passengers deep into the mountain. We hired our boat and two guides with big headlamps and off we went on the 2 hour round trip through the cave to the other side of the mountain and back. It was a good thing the guides had lights, because my little light didn’t do much against the darkness once we turned from the light of the opening. The ride was very surreal, and in spots the river got quite shallow so we would hop out, walk a few feet and get back in. We came up to a sandy area, where we were told it was time to get out and walk a little. Luckily, there were lights to guide the way. 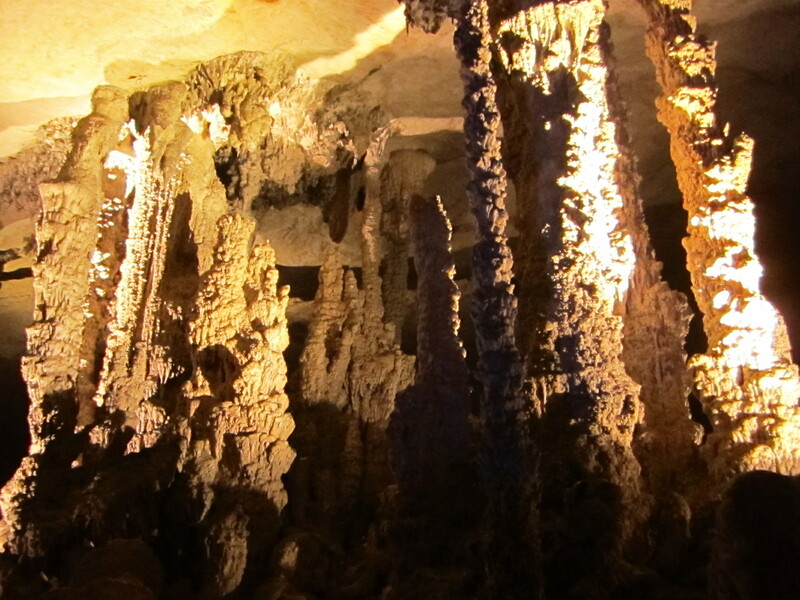 On our short walk, we passed some very impressive stalactites and stalagmites, and althought we were right next to the river, we could only hear it splashing over the rocks. It had been described to us as creepy, but I found it very dramatic and peaceful at the same time. We got to the end of the path and found our boat there waiting for us. The ride then continued through the dark until we spied a little bit of light ahead. It grew and grew and eventually we passed through the opposite end of the cave into the lush green jungle. What a sight! There was a black buffalo with it’s baby off to the side of the river, taking a snooze and a bath as we passed. After a short stop on the bank, we headed back through the cave to the point we had started. It was now 2 hours later and the lake and cave entrance had become much busier with locals coming to celebrate Songkran. We joined them for some rock jumping and swimming before heading back to return the motorbikes. Once that was done, we were off to Vieng Kham again to flag down a bus to Pakse. The bus ride was definitely a memorable one. We got onto the bus to find that there was hardly even standing room. After some rearranging of people, we were put on small plastic stools in the isle with a bunch of other people crammed in. There was very little chance of sleeping unless we curled up to our knees and didn’t hit any bumps. The ride in the isle lasted about 5 hours before some other people got off and we quickly took over the seats for the next 4 hours and finally got a little sleep. 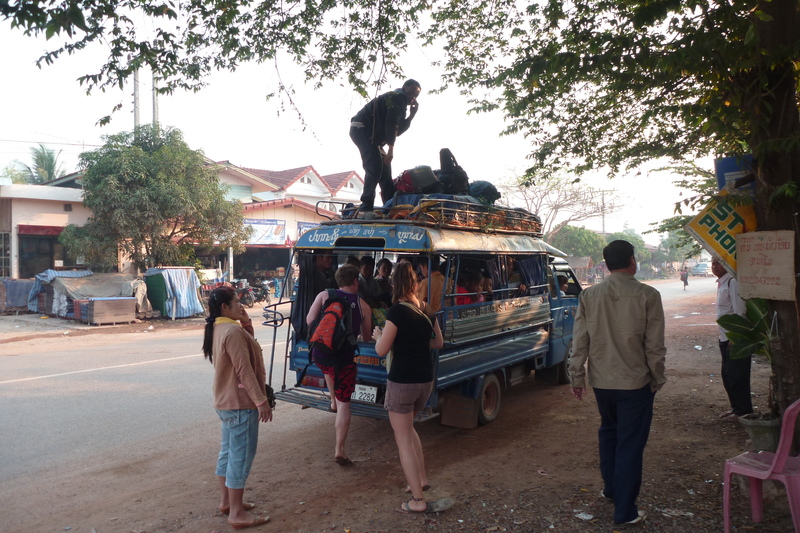 The bus got to Pakse at 4:30am which meant that the guesthouses were all closed. We we allowed to get inside the gate at one place and sleep on the benches until it opened. Once we got settled, we took a wander around town to get breakfast and try to find the market. We ended up finding a group of people celebrating Songkran with buckets of water, a hose, beer and karaoke. We stayed there for a while, getting soaked, dancing, sneakily avoiding eating chicken feet, and drinking beer. Then it was time to try to find the market again. Instead, we found more people celebrating who invited us in. As the party started to really get going, more foreigners joined us. We eventually wandered off, joining a number of other groups for short times and even getting involved in a parade. We stopped in front of an Indian restaurant and continued the water fight. At this point, trucks full of soaked people were slowly driving around with big buckets to get pedestrians, music was coming out of the shops and the cars, and people were everywhere throwing water and putting baby powder on others faces. This is also where Tom had a very unfortuante run-in with a motorbike. But he got up like a champ, helped up the startled bike owner and got right back in the game. What an amazing day! The next day the tour started again with a tuk-tuk through the water fight to the bus station, where we ended up getting another (bigger) tuk-tuk for 3 hours to the 4000 Islands. We got a short boat ride to Don Det and found a bungalow on the sunrise side with hammocks on the porch. The island had a curfew of 11pm, so each night we headed out to one of the open sided restaurants along the river to eat and watch the sunset, then everyone headed to the beach for a bonfire after curfew. 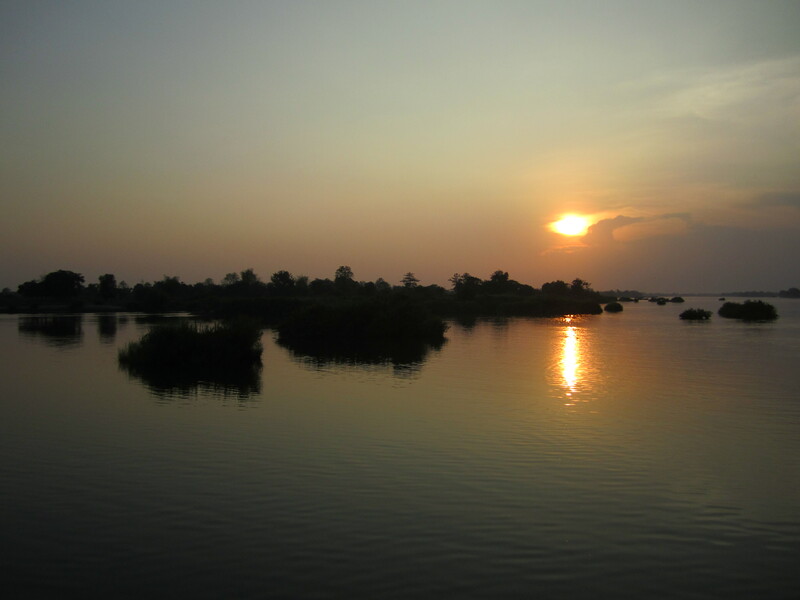 During the day, we took a bike ride to Don Kone and saw the spot with the Irrawaddy dolphins, the beach, and the waterfall before riding back. It was pretty scorching hot, so although the island was flat, we were exhausted. The hammocks helped with that! Don Det ended up being 4 days of island bliss and the perfect end to the Back of Beyond tour. Up next, Cambodia! great video, great song choice and REALLY great to hear your laugh! I agree with Amy – it was SO great to hear your laugh 🙂 The video is fantastic. I have the biggest smile every time I look at your site Kerri, can’t believe everything you’re experiencing…and it’s scaring me you won’t come back to boring Canada!! Missing you.